We've been grilling almost daily since our AC broke last week, so it was only a matter of time until we had our fill of steak, burgers, and ribs and moved on to fish. You can usually find mahi mahi or ahi tuna in our freezer—it thaws surprisingly quickly, cooks up in about three minutes, and tastes meaty enough to make you forget you're having fish in your tacos instead of carnitas or carne asada. 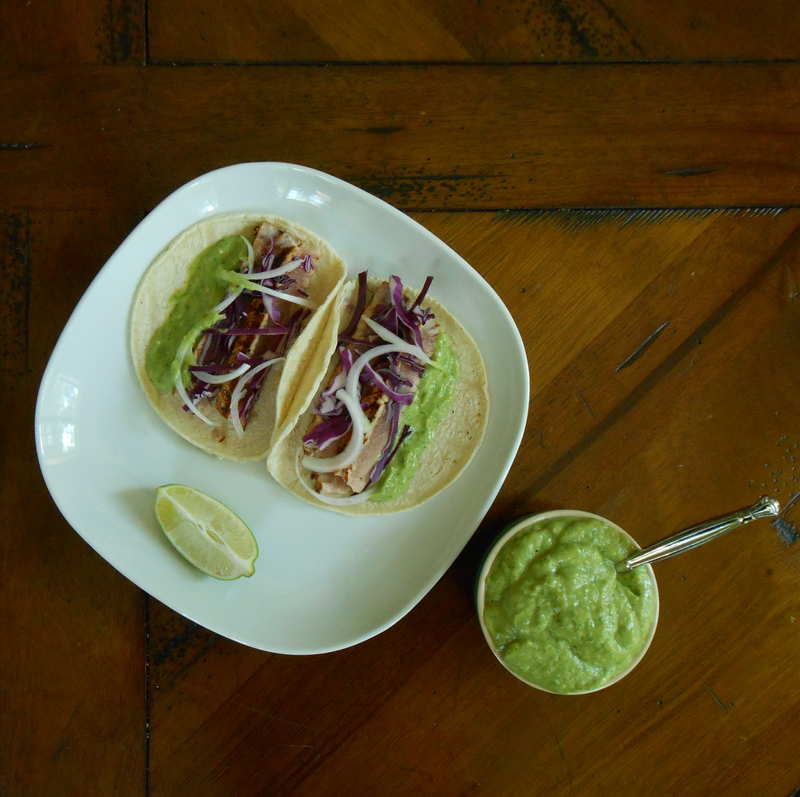 We keep the garnish hot-weather-friendly (no cooking required), with thinly sliced red cabbage and onion, lime wedges, and a creamy-spicy-tangy salsa verde from Food Wishes that takes about a minute to make. Serve it all with warm corn tortillas fresh from your microwave and, as always, enjoy. 1. Bring half of a grill to high heat. (If using a charcoal grill, burn half a chimney of coals until covered in white ash and pile on one side of the grill. If using a gas grill, turn the burners on half of the grill to high.) When the grates are hot, scrub with a grill brush and grease with an oiled paper towel held in a pair of tongs. 2. If using frozen fish, defrost by placing sealed package in a large bowl under cool running water until soft to the touch, about 10 minutes. Remove fish from package and pour off excess liquid. 3. Pat fish very dry with paper towels. Season all over with black pepper, cayenne, paprika, and 1 teaspoon salt. Coat with 1/2 tablespoon oil. 4. Place fish on hot side of grill. Sear until dark grill marks form, about 45 seconds. Rotate 60 degrees with spatula. Sear until dark grill marks form in the other direction to make a crosshatch pattern, about 30 seconds. Flip with spatula and repeat on second side. Remove from grill immediately. Scrub the grates with a grill brush before going back inside. 5. To heat tortillas, place a damp paper towel on a plate. Place a tortilla on top, then another damp paper towel, then another tortilla, and so on, until you have a stack. Top the stack with a damp paper towel. Microwave on high for 30 seconds. 6. To make salsa, purée all ingredients until smooth in food processor or blender. Taste and adjust seasoning. 7. Slice fish against the grain at 1/2" intervals. Assemble tacos with warm tortillas, fish, cabbage, and onion. Serve with salsa, lime wedges, and plenty of napkins. Interesting tacos, thanks for sharing.